The Government has not denied that the cost of delaying the aircraft carriers by up to two years is one billion pounds. In fact a senior Labour minister admitted this last night to me. That's a twenty five per cent increase in costs. The decision the MOD faced was either to cancel other defence contracts or delay the carriers in order to adhere to annual spending limits. Therefore value for money has been sacrificed in order to mop up after Labour's mismanagement of the public finances and the expensive Iraq war. Yet, the delay, and the resultant cost increase, also has consequences too as future equipment contracts will not now proceed. So Labour are busting the bank now so that it will be impossible to pay for the essential equipment for the future. It was obvious that costs would rise when the Labour Government delayed the carriers contract. The Government were warned. Yet, the scale of the rise, if Robert Peston is right is staggering. However, if Britain wants to project force in far flung parts of the world it will need these carriers. Likewise if we want to provide humanitarian aide to similarly remote nations the carriers will be required. I will be quizzing Ministers about these reports. We deserve answers - as do the workforce. A few months ago I was effectively warned off making a fuss about the future of the Crombie munitions depot in West Fife. The warning came from a senior DSDA (Defence Storage and Distribution Agency) official who tried to reassure me that the depot potentially had a bright future. I've not heard from the man since despite subsequent announcements that staff levels were to be cut to 26 then 15 from 43. Now I'm not arguing that efficiencies should not be made but I am seeking a plan, leadership and fair treatment for the staff. Yet this munitions depot (bombs and the like) is being run down in a chaotic manner. The DSDA and the MOD could learn a few things from Shaggy and Scooby. Three years ago the Minister agreed the Future Report on Crombie (FROC), the the Treasury announced DSDA could be privatised and the recent announcement is a straight forward treasury driven cut. I say announcement but they didn't even bother to tell me about the latest cut - I heard from an anonymous source. There's a nice little report in the Courier today on the coal race. My main opponent in the race, Labour Councillor Willie Sullivan, needs more sponsors. Please give if you can. My back is aching but it's purely self inflicted. I ran the Scottish Coal Carrying Championship today for the third time. One hundred weight of coal in a sack on your back for one km is a bit of masochism but it's good masochism. Willie Sullivan, Labour councillor and good friend friend, ran the race for the first time. I beat him to the line but only just. Another victory for the Lib Dems over Labour!! My bill to introduce the power to suspend driving instructors has sailed through its third reading today. The bill ensures that learner drivers are protected from those convicted of sexual offences but have not yet been removed from the register of approved driving instructors. The bill will now be guided by my old boss Lord Paul Tyler through the House of Lords before it hopefully receives Royal Assent. Today the campaign for free visas for Chernobyl children from Ukraine received a big boost today with coverage on the BBC. The Prime Minister has promised me a meeting with the Home Secretary to discuss why these children are being disadvantaged. The Chernobyl childrens' charities will be joining me to make the case. It's peanuts to the Government but a fortune for the charities. John Bercow's acceptance speech was as reassuring as it was eloquent. who represented a new generation. I don't envy his task but he has the talent to deliver. My MSP colleague Jim Tolson and I joined Terry Fowler from the Royal British Legion to officially raise the special Armed Forces Day flag at the City Chambers in Dunfermline today. Armed Forces Day is an opportunity to salute the men and women of our armed forces both present and past. Thanks to many factors including the war in Iraq there has been a fear that the reputation of our armed forces has suffered. Hence the reason that Labour established the special day. Yet I think the reputation of the armed forces remains strong and it is the Labour Government that people clearly hold responsible for the war. Stepping in at the last minute I officially opened Torryburn Primary School's multi sports court on Saturday. I joined Jim Tolson for a game of short tennis. The school has grown in strength in recent years. It's great to see them doing so well. Nick Clegg's announcement about Trident today is spot on. The world has changed since the height of the cold war. No longer do we need a full blooded Trident system that covers all eventualities no matter how unlikely those eventualities may be. We need a comprehensive defence system that deals with foreseeable risks. To dole out for a hyper expensive Trident system when the public finances are in a mess and our troops on the ground are in desperate need of more helicopters and the right kit would not be right. Trident fan Tory MP Julian Lewis and I engaged in a debate on BBC Radio Northampton today. His position is a counsel of despair - he wants Trident forever because, he says, he can't predict what's round the corner. He's made up his mind that we're keeping Trident. He's scuppering the Non Proliferation Talks next year before they have even begun. That doesn't mean that we won't support some form of nuclear deterrent just not a gold plated one. We need something that's appropriate. I also want Britain negotiate our nuclear weapons away in next year's talks and the position taken today will significantly help the preparations for those talks by putting our nuclear deterrent front and central. I snuck in at number nine on the order paper to quiz the PM on Chernobyl children. I highlighted the anomaly that means Chernobyl children from Belarus who have recuperative holidays here receive free visas yet Chernobyl children from the north of Ukraine don't. That's the case even though the contamination in the north of Ukraine can be even worse than that in Belarus. The PM agreed that I should have a meeting with the Home Secretary to discuss the issue. I am sure they will see the benefits of free visas for all Chernobyl children so that even more can benefit from holidays here. At breakneck speed this morning my Driving Instructors Bill passed its committee stage. In forty-five minutes we covered all seven clauses, two schedules and twenty six government amendments. Michael Connarty, Greg Knight and Robert Goodwill asked some very valid questions about dealing with malicious complaints, how serious the case would need to be before it required suspension and re-entry onto the register. The Bill received unanimous support. It's a good example of cross party cooperation. The Bill now goes for Report and Third Reading on Friday 26th June. In two short debates this evening Parliament gave approval for the Money Resolution and the Ways and Means Resolution for my driving instructors bill. Those who have been listening carefully will know that my bill will bring in a power to suspend driving instructors convicted of sexual offences and the likes whilst their removal from the register is considered. The resolutions allow for the funding of a compensation scheme for those who wrongly suspended and to enable a charge to extend the scheme to trainee instructors. The Bill now goes to committee on Wednesday. So much for Gordon Brown's grand democratic renewal programme. It lasted for just five days. Today the PM announced a secret Iraq inquiry to be led by five establishment figures which will take until after the next General Election to report. This is the old politics designed to sweep this colossal error - to invade Iraq - under the carpet. The PM must change his mind. My Saturday nights have not been wild since I was a student through in Paisley - even then they weren't that wild. But last weekend instead of touring the pubs and clubs I spent a beautiful evening collecting wood with my good neighbour Duncan. You see Duncan has installed a - what seems like an industrial sized - wood burner in his garage to heat his house and water. It's so big I reckon it could heat the street. This wood burner is hungry and swallows up large quantities of trees. We would have collected the wood if we had spotted the swamp before it was too late. An hour later and with the help of the farmer and his tractor we started upon our task. I suspect we'll be back though as there's lots more to chop and his burner is still hungry. So much for living off the land. Dunfermline and West Fife is increasingly seen as an alternative to Edinburgh to base your business. In the last ten years we have seen literally thousands of people from the capital opting for the pleasures of the ancient capital. Now businesses are following suit with Taylor Wimpey and now the Scottish Society for the Protection of Animals siting their HQs here. I had the pleasure of visiting the latter's new HQ in Halbeath on Friday. The modern offices are ideal for their animal rescue hotline, fundraising, marketing, education and PR functions. Their inspectors save thousands of domestic, farm and wild animals from harm and danger every year. 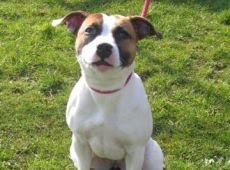 Their vets and staff in their centres look after, rehabilitate and rehome thousands more animals. All this - and more - is paid for by fundraising. They receive no Government support. They are very welcome in Dunfermline. From afar I loved the Tories ripping out each others innards in the Maastricht Treaty battles of the 90s. The colourful suited eccentrics against the grey John Major characterised the trench warfare that was all consuming for the Conservatives. Thanks to Ken Clarke the Tories are heading straight back there. He let slip today that if Ireland says yes the Tories won't hold a referendum. What's changed is that the centre of gravity of the party is now firmly in the Euro sceptic camp. So I suspect Ken and his Euro sensible colleagues will have more of a difficulty in winning this fight. How odd it would be if the Tories ended up contesting the next General Election on a platform of no referendum when they, falsely, criticised the Lib Dems on the issue as recently as last week. And especially since the Lib Dems advocated a real (in/out) referendum. How odd. Last Sunday it was a delight to enjoy a post election bit of culture at the Abbey Gardens in Culross. 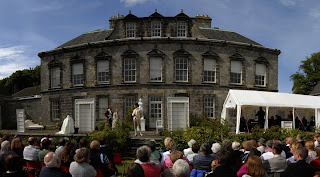 In glorious sunshine we enjoyed The Marriage of Figaro in the garden of Charles Bruce's home as part of the Culross Festival. The festival organisers deserve plaudits for the quality of this annual festival. Coal carrying - will I again? 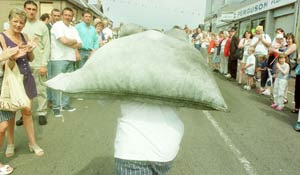 I'm tempted to endure the pain that will surely follow from taking part in the annual Scottish Coal Carrying Championships in Kelty later this month. I'm tempted as I hear that my good friend and Labour Councillor Willie Sullivan is training for the event. Avid followers of the race will know that I was runner up in 2003 and third in 2006. So I've got a reputation to defend. We've just started beating Labour in West Fife and I'd rather that didn't change even if it means carrying a hundred weight (56kilos) for 1 km along Kelty Main Street again. The race takes place at 12.15pm in Kelty on Saturday 27th June. For more information contact Michael Boyle, 23 Westcroft Way, Kelty, 01383-831782 / 07715304798. After three years in the Commons you would think I would have learnt not to get too excited about reports of radical reform proposals from this Government. This week we had the prospect of electoral reform. Perhaps, just maybe, at last, a death bed conversion - but no just a promise to think about it from our conservative, defender of the establishment PM. The Tories and Labour were united for a brief paragraph. United in condemnation of change. Determined to defend their in built advantage. I suppose I shouldn't criticise them for defending a system that has padlocked their grip on power for decades. Apparently PR gave us the BNP. Apparently it had nothing to do with those who voted for them. No it was all because of the system! I'll not get my hopes up again in a hurry. It is increasingly apparent that our vote and performance at each election is robust. We don't seem to suffer from wild declines like Labour and the Tories. It's a tribute to our solid work to convince voters of the merits of our team and approach. Just like the locals where we increased our share of the vote to 28%, we've increased the number of seats in the European Parliament. In key marginals we did especially well taking the lead in a whole host of seats where we are hoping to win at the General Election. What is especially satisfying is that we fought the campaign on a pro European ticket and, despite what the sceptics say, we didn't suffer. If there had been a clearer focus on the range of relevant and crucial European issues I am confident we could have had a stimulating debate and benefited significantly as a result. Although Gordon Brown was on reasonable form today at Prime Minister's Questions he certainly had to be to cope with the storm that is raging around him. The Westminster village loves the chatter on who's up and who's down but the crisis in the cabinet and the crisis in the parliament on expenses has created a massive policy and leadership vacuum. Issues like GM motors, the ongoing failure of the banks to lend, the growing levels of unemployment and the many serious European issues have been left on the sidelines by the Government. The Government will be hamstrung by its internal disputes and parliament by the expenses scandal until we have the cleansing process of a general election. That's why I'll be joining my colleagues in the aye lobby next week on a motion of no confidence in the Government. And I would argue that many Labour MPs will be tempted by the thought of an election too. Many have simply had enough, can't see any way forward for this government and want to take their chances with the voters. We have, at long last, had some good press this week. The Guardian Editorial today reported "The case for supporting the Liberal Democrats is now very strong." Polly Toynbee came out in support today too writing: "On the economy or crime co-operation, "stronger together, poorer apart" is a good Lib Dem pro-EU slogan. They best deserve the vote of every pro-European on Thursday." The Observer extolled the virtues of the Lib Dems on Sunday: "This Thursday's vote is being held in a uniquely febrile climate. It should be about Europe; it will be about the expenses scandal. On both counts, it is a moment to reward the principled consistency of the Liberal Democrats." And to top it all a poll in the Sunday Telegraph putting the Lib Dems on 25% - ahead of Labour. Not that I pay too much attention to polls but it's nice to have a good rating all the same. We've been working hard to get our message across about the necessity for international cooperation and reform. We are internationalists and reformers after all. Let's hope it pays off on Thursday.